How Does Water Get in My House from Outside? Posted May 24, 2016 by - filed under Waterproofing. Is there water intrusion in your home and how does it get there? The first way is that it can come up below the footer. Your house is built on a footer and then the wall is attached to the footer, and if you have a basement, you have a concrete slab that is poured and meets the footer and the wall at that joint. If you have a crawlspace, you have the same thing with the footer and the wall, but you have a dirt floor. So water can travel up into the house from underneath the footer or underneath the floor. The second place it could come in from is where the footer and the wall meet. That joint often times will leak and water will find its way into the basement or the crawlspace through that imperfect joint. Third and lastly is through cracks or seams or holes in the wall. Water pressure, hydrostatic pressure on the outside of the house, can push through those cracks and leak and get into your home. So, how do we fix this problem? Well, you can do it on the outside with a perimeter drain, often called a French drain, or a curtain drain. Or you can do it on the inside with an interior footing drain, and we can discuss those in a later post. Watch this video of John Lombardi with United Structural Systems who answers the question: How does water get in my house from outside? 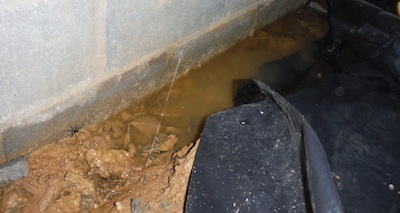 Learn more about waterproofing or if you have any questions about water intrusion in your home, whether it be a basement or crawlspace, call USS at 615-227-2275 or fill out the online form.